Wade the duck has always confused me. He always wears that floaty thing, because I guess he doesn't swim that well, but it has a miniaturized version of his head on it. That's weird in itself, but it also always has a similar facial expression to his, and if he happens to be wearing anything, the mini-duck is wearing it, too. Did Orson get Wade a scarf, and somehow a tiny scarf appeared on the duck head, too? Or did Orson get scarves for both Wade and the mini-duck? It's confusing. I'm guessing Orson put the sweater on Sheldon, unless he somehow is able to use his feet to do so. I do wonder why Orson felt the need to add sleeves. I guess he's confused, as the rest of us are, as to why Sheldon hasn't hatched completely yet, and figures it has to happen soon. As someone who has hand-made Christmas presents for the past few years, with varying degrees of success, I can tell you that the best way to do it is to prepare well in advance, begin making them long before you plan to send them, and try to let the amount of thought and care you put into them show through. Otherwise, it just ends up being a disappointment for you and them. There are different rules for kids, though. If you're a kid and you make a present yourself, it counts ten times more than if you buy something. Period. Even if it is a mud pie. This only works up to about 14 or 15, though. The relationships in U.S. Acres are a little odd. Orson, the pig, is called "Mom" by the chicks Booker and Sheldon, I guess because he takes care of them for some reason. Roy, the rooster, is never said to be the father, even though he appears to be the only rooster on the farm. Then again, there are no hens on the farm that we ever meet, so I'm not sure who the mother is. I also don't understand why Sheldon didn't get a stocking next to Booker's. Orson just put his own up there and forgot about it, I guess. Look, just because most of him is still in an egg doesn't mean he doesn't know when he's being left out. U.S. Acres was a comic strip created by Jim Davis, creator of Garfield, that ran from 1986 to 1989. Its main cast is a group of farm animals. 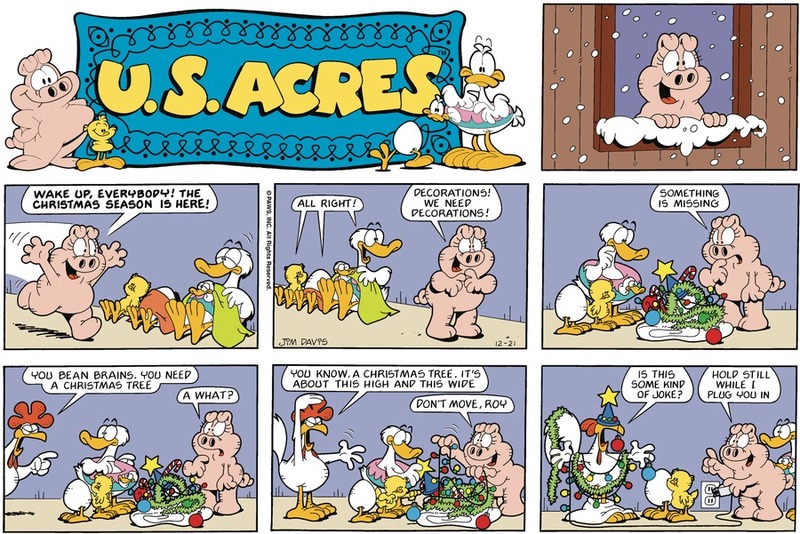 This particular strip features Orson the pig, Wade the duck, Booker the chick, Sheldon the only partially hatched chick, and Roy the rooster. It's an interesting strip, because it wasn't nearly as popular as Garfield, most newspapers only ran the Sunday strip even though dailies were produced, and it only ran for 3 years, but the PAWS corporation has had its full force of marketing behind it for years after it ended. At launch, it was in over 500 newspapers, which is astounding, but most people only knew about it from all the book collections and children's books that were subsequently published. An animated version was part of the Garfield and Friends TV show in the 90s, after the strip had ended. You can still read it on Garfield.com and on GoComics. It's certainly had a better life outside of newspapers than in.